CM-B2 Full automatic blow molding machine is suitable for making PET plastic containers,it can blow all kinds of bottles in shapes:carbonated bottles,mineral bottle,pesticide bottle,and other packing containers.It has saved the cost to the maximum extent;it has lower rejection rate,higher production,and more stable preformance than the semi-automatic one,and moreover,run smoothly and easy to operate. 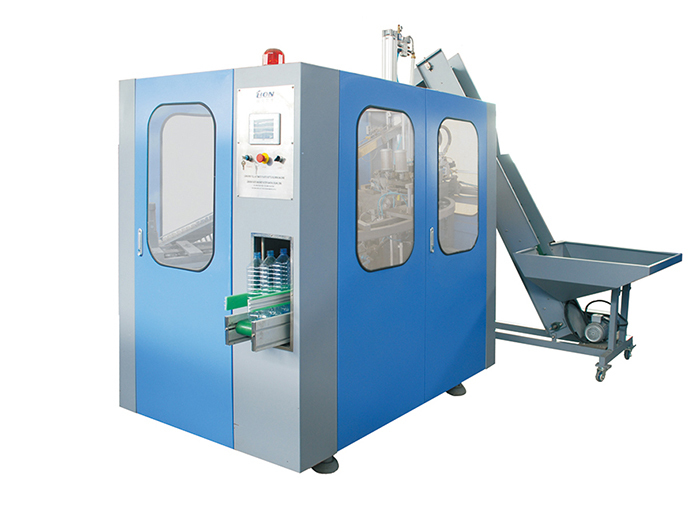 CM-B2 two cavities automatic blow moulding machines(2-5Liter Bottle) are widely applied in blowing hollow plastic containers of various dimensions. Advantage of stable quality of products, reasonable design of structure of machines, small size, low energy consumption, easy operation and convenient maintenance. CM-B2 Automatic blow moulding machines are treated by high and new technologies, precise machining and careful assembly to attain technical requirements of all aspects. Moving parts are connected with boundary lubricating bearings and straight guide rails. bumper is adopted for preventing mechanical bumping, which ensures low mechanical noise, low failure rate and long service life. Moreover, unique design of air blowing mechanism ensures very high output rate of finished products.